Hibiscus Tea has a great therapeutic value due to its cardioprotective, anti-inflammatory, anti-cancer, cholesterol lowering, and metabolism stimulating properties. It also has a gentle laxative and mild antitussive action. Hibiscus tea is an herbal tea made from the sepals of the Hibiscus Sabdariffa (Roselle) flower. The hibiscus delicious herbal tea is great for you and has several health benefits. About: Hibiscus is a bushy annual plant. Hibiscus plant grows in tropical areas and produces orange red flowers. These flowers have been used for centuries for various medicinal purposes. It is also called (CHINA ROSE).Its flowers are harvested, dried and can be steeped as a hibiscus tea. Hibiscus tea is also a rich source of Vitamin C and iron. Vitamin A is also present but in small amount. Those who are trying to find natural and ayurvedic methods of healing illness and diseases, hibiscus tea is a good solution for them. This hibiscus tea has been gaining the popularity over the past few years due its benefits. The tea can be enjoyed hot or cold with different ingredients for different and unique taste. Place hibiscus flowers in the cup. Put boiled water over them. Allow to steep them for five minutes. You can also add lemon and mint in it for enhancing the taste of it. Mix sugar, water, cinnamon and ginger in the sauce pan. Heat the mixture until it mixed well. Now put the whole mixture in the cup of dried hibiscus flowers and stir well. Let it to be steep for 20 minutes. Put ice or place it to be chilled. You can also add lemon and mint as per your taste. Steep the 4 tea bags of hibiscus tea and mint leaves in 4 cups of boiling water for about 10 to 15 minutes. Add 2 cups of cold water and apple juice in it. Refrigerate it for chilling. Serve it. Hibiscus Tea is mainly useful due to its antibiotic like action, which helps fighting off bacterial infections. Its antiviral action reduces common cold severity and gives early relief. Scientific research has suggested it reduces blood pressure, abdominal spasms and uterine cramps. The main action of Hibiscus in cough is to dissolve phlegm and reduce its stickiness and thickness. Due to this mucolytic action of Hibiscus tea, it is beneficial in productive cough with excess amount of thick and sticky mucus. In cold, it is beneficial when one has nasal-congestion, sneezing and thick discharge from the nose. These symptoms appear after 1 to 2 days of common cold attack. Hibiscus tea is also rich in vitamin C, which has antioxidant action. The essential phyto-nutrients present in the hibiscus tea boost our immune system and helps the body to fight off illness, flu and infections. The anti-oxidants (bioflavonoid) present in hibiscus tea helps to remove plaque from the walls of the arteries and puts positive effect on the cardiac health. These bioflavonoids reduce cholesterol and triglyceride levels. Lowering cholesterol levels improves cardiac health and decreases the heart related risks. Tip: Adding a pinch of black pepper in the Hibiscus tea increases anti-cholesterol properties of Hibiscus. Hibiscus Tea is useful in mild to moderate hypertensive cases. Its antihypertensive action and hypocholesterolemic effect of Hibiscus Tea is attributed to Anthocyanins, polyphenols and hibiscus acid present in Hibiscus. Anthocyanins inhibit LDL-C oxidation, which helps impeding atherosclerosis or narrowing of the blood vessels. Antihypertensive action of Hibiscus Tea or Hibiscus extract is comparable with CAPTROPRIL. 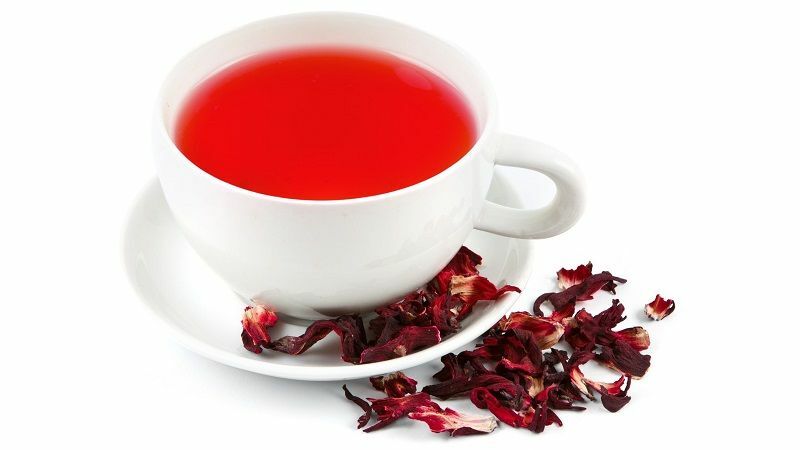 Moreover, Hibiscus tea is a diuretic and increases urination, which may also help lowering blood pressure. Patients who have hypertension (high blood pressure) can take hibiscus tea daily. The anti-oxidants present in hibiscus tea helps to reduce free radicals in the body and can prevent pre-cancerous cells from growing. In this way, hibiscus tea reduces the risks of having cancer in the body. Hibiscus tea has been used for centuries to treat mental related problems such as stress, depression, anxiety etc. The people having mood swings and depression should take hibiscus tea in their daily life. This will put positive effect on their mind and refreshes the nervous system. It gives calm to the mind and the body. Adding Brahmi (Bacopa Monnieri) leaves in the tea increases its efficacy. Hibiscus tea is LIKELY SAFE & WELL TOLERATED within the dosage described in this article. There are no side effects reported with hibiscus tea regular use for 8 weeks. There is some evidence that hibiscus might start menstruation, and this could cause a miscarriage. There is not enough reliable information about the safety of taking hibiscus if you are breast-feeding. Stay on the safe side, and avoid use. Hibiscus tea may be unsafe and not recommended for the pregnant women or those who are undergoing fertility treatments. It lowers the level of estrogens in the body and can cause menstruation, which may lead to miscarriage or bleeding. Specifically, pregnant women in first trimester should not take hibiscus tea. Women having hormone treatment or taking birth control pills should not take hibiscus tea. The safety information about Hibiscus tea use by lactating mothers is not available, so avoid taking it during this period. Drowsiness & Hallucinations: After drinking hibiscus tea, one feels a bit drowsy. However, it is not a side effect, but it helps you to relax and fall asleep because it has mild hallucinogenic effects. So, one should avoid to take this tea if he is planning to drive a vehicle or operate heavy machinery. Low blood pressure: As taking hibiscus tea lowers the high blood pressure, but the people already have low blood pressure should avoid taking this tea. It can further lower pressure and increases health risks. None of the claims in this article are supported by citing research results. We will add references. It’s in our to do list, but it may take sometime. Information in the article is correct.